so now I have a spare moment to bring everyone up to date on all that is goings on. I know many of you wonder what in the world does your Chief do? called Apollo Express INC. located in Bridgeton, Missouri. I try to be available for you to speak with me on my cell phone, but sometimes that is just not possible so just leave me a message or text (I am getting pretty good at that). If it is an emergency, please call the office. If you are just requesting paperwork, contact the Clinton, Missouri, office at 660-885-7779 and Buffalo Sister will be glad to help you. She is there 10 am to 3 pm most days. We also have much information here on the website. Don't forget we have a Facebook page too. As many of you know, things have been moving slowly along in the process of our quest towards federal recognition. The immense amount of paper work and the verifying of fact and dates is an extremely difficult process, We only have a few volunteers who are willing and able to work on this and their time is limited. I will be taking additional time off after our Pow Wow this September 15, 16, and 17 to work on this mountain of paperwork. Sorting through old records is tedious but fascinating. The fact that it was illegal to be an Indian in the state of Missouri shows just how determined we were to survive! Please don't get discouraged with the progress we are making, things are moving forward. remember we depend on your donations to keep moving forward. I hope many of you have been keeping up with the Tribe on Facebook and the web-page and sharing with your family who may not be connected to the internet. Updating your files if you have moved or married, changed your phone number or e-mail, these things are so important in the recognition process. The NCN has been involved with many civic affairs including the Clinton "Old Glory Days" Parade, which we won "Best Walking" trophy, the Washington Missouri Town and Country Parade, along with several speaking engagements that I, as your Chief, and or tribal council citizens have attended. We had the honor of being one of the sponsors of "The Darkening of the Sun" event that was held on Hawk Arrow Springs in St. Clair, Missouri, property owned by Councilman Bill Hawk Arrow Buell. It was a wonderful time. Darkening of the Sun. Now on to the less enjoyable facts, Last year at Pow Wow our grounds endured some severe damage due to heavy rain and many vehicles getting mired down in the mud, we have been unable to spare the extra funds to repair the damage, and with all the rain this season it is not getting any better. We need your help. This year we sustained water damage that our insurance would not cover and two of our computers were damaged. We need your help. We also had an attempted break in, so we need security camera's. We need your help. Remember these are your tribal headquarter and grounds. I am only the guardian of your headquarters. Help me to maintain them. Just like your home there is the mortgage, lights, phone, internet, fuel, insurance, these all must be paid, plus all the office supplies. We need your help. Remember we are a 501(c)3 tax exempt organization. We receive no state or federal funding. Your donations keep the doors open . I ask you to please be generous. We have PayPal for your convenience, this is a safe and secure way to make your monthly donation. We also accept checks and money orders which can be made out and mailed to NCN, P.O. Box 413, Cuba, MO. 65453. These are just a few of the ways you can help lighten my burden. I hear all the time, we would love to help but don't know how because we live so far away. Gift cards to Wal-Mart for food for our volunteers who donate their time, Staples for our office supplies, fuel cards to help offset their expenses for driving long distances to work at headquarters. The paperwork for federal recognition goes on and on. In three weeks I will be taking some time off from work to concentrate on our history. George Sumpter, and old Cherokee historian, and others will be helping. Right now it is all about enrollment. We have just been told that we have a very interested party that will match any and all donations up to $2,500 that are earmarked for this part of Federal Recognition! The projected amount to have our enrollment ready to submit is approximately $28,000. Obtaining federal recognition is not cheap. With about 14,400 enrolled citizens, this is a big project! We just passed the 2000 mark. On a good day we will do two to three hundred files. As time goes along, we will soon see how many citizens give a hoot if we are recognized or not. The next few months are going to get intense. Please help us pull in the matching grant. REMEMBER THIS: Federal recognition benefits YOU! See above paragraph. Also remember this, we only get the chance to do this once, and only once. Go to the website, call, help, get involved. If you can't do anything else, e-mail us and say "thank you" and you appreciate what we are doing for you. We know many of you can't be here, but this is the one time in history when everyone needs to do whatever they can. We have come a long long way. Honor the ancestors. Plan for the grandchildren. be Cherokee proud. We have on our webpage PAYPAL, and on the Northern Cherokee Facebook page there is a GO FUND ME account that has been opened. We already have $250 donated, watch the progress, be part of it! You may also sent your check or money order to NCN, P.O. Box 413, Cuba, MO 65453. Please put in the memo line, "For Federal Recognition" so your donation can be recognized. Don't leave this up to the other guy, we need everyone to help! I know we can do this. I'm counting on you! Share this with your family and loved ones that don't have internet access. Here we are in the fourth quarter. Where has this cycle gone? So much going on. So little time. So many deer. Mother Earth was generous this time. Our battle for federal recognition goes on. We know we will win and we know it will be hard and very uncertain. We just found out we are the first to apply under the new rules. I had foolishly hoped a few other tribe would muddy the waters a little, but no, we're it. This process is very fluid and somewhat mysterious. We have a very DEDICATED AND HARDWORKING staff willing to drive and work long hours. Paper, ink and gasoline for travel, what this process is running on now, it's that simple. Wado Wadaduga and Galalo for organizing hundreds of pounds of records and other vital information into something usable. Wado Buffalo Sister for all you do, typing, filing and knowing you are there 24/7 to answer any call. Wado Singing Dove for trying to make heads and or tails of our enrollment, and doing it. WaDo Fast Knife for computer magic I am clueless about. FastKnife is our official Recognition Coordinator. He and I will be going to Washington to do battle with the unega. He gets to call the BIA from his office instead of me from the cab of my semi. Last but not least, many wados to those who spent many hours on the phone trying to find YOU, our Citizens. NORTHERN CHEROKEE PEOPLE,I ask you to think of this. Remember all the times when someone calls us "wannabes"? When we had to explain our history to the uninformed? When we were insulted and disrespected, of all people, other Cherokees who have forgotten that not long ago they were in our shoes. These days will soon be over. Think what that will mean to you. How important is this to you? For those of us with a true Cherokee heart this means no more explanations to anyone. We have always known who we are, but how great is it for the rest of the world to know. I grew up in the " Black Dutch" time. It was preached to us to never let anybody know. Never speak your language in public. My Grandmother always told us, they have taken everything else from us, but they can't take that, meaning our language. This fight is not over, there are pitfalls and disappointments. There is hard work and long hours. This is for all of us. Our ancestors, and our great, great, great grandkids. This is the most important battle any of us will fight. JOIN THIS FGHT. Call us, talk to you family, go sit on a creek bank and think what this will mean, BUT JOIN THIS, IT"S YOUR FIGHT NORTHERN CHEROKEE CITIZENS!! Good news abounds. First the office, as some of you already know, the Bureau of Indian Affairs will soon be visiting the tribal office. We wish to look like we are who we say we are. In a month’s time, we have added security cables to the entrances. No more water being turned on and left running or things leaving in the middle of the night. The parking bumpers are now painted. The propane tank is being painted with murals. Old signs are being removed. The front of the building that says Northern Cherokee Nation has been rebuilt and painted. Lots of other cosmetic work outside but wait till you get inside! I still can’t believe my eyes. All the old office furniture is gone. The old tables in the council room gone. The old construction materials and junk in the addition are gone. Talk about smoke signals. What a fire! Remember citizens, this was a dream of my wife Busy Red Bird and her daughter Cindy Little Bear Linchey. Their painting the office escalated to a complete redo!! We now have new office desks and chairs, new council chairs, and I say new beige file cabinets for 14,000 files. Thank you Mitzi, Sarah, Amy, and Jeff, who own Finishing Touch Construction Clean-up, and are tribal citizens. That’s not all! The office was painted first by Mrs. Chief and Cindy Little Bear, by brush, and many weekends spent at the tribal complex. Thank you Finishing Touch for jumping in and lending your help realizing how long it would have been to do by brush. They masked off the council room and sprayed painted it all! WOW, then they scraped the office and council room floor and painted them with swimming pool paint and sealer, but we are not done yet, the old bathrooms in the council room will be redone this weekend. I know I probably left something out, but our Tribal headquarters just about glows in the dark. 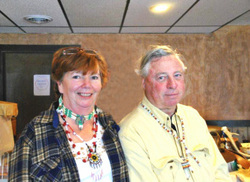 Now for some WaDo’s: Mike and Linda Ford have pledged new blue flame propane heaters for our building. Would someone like to step up for 500 gallons of propane? WaDo to Council Woman Jane Hicks for being there every second needed, and taking time off from her job just to unlock the office. A “wado equa” really big thanks goes Mitzi and Jeff of Finishing Touch Construction and Clean Up for tireless and endless hours away from their business. Many thanks to Amy for going out and getting the donations of office furniture, and Sarah for all your help in the office. I don’t think I could have kept up with those girls when I was young. Mrs. Chief and Little Bear, your dream is coming true! Much more to come. Why all of this, you say? Can you spell Federal Recognition? The dream of past generations is about to come true. Either I or our Northern Cherokee representatives have attended meeting with the BIA in Phoenix, Arizona, Marksville, Louisiana, Portland, Oregon, and Mashpee, Massachusetts. These meetings were designed for non-recognized tribes to make recommendations on how to make the recognition process more efficient. So Far, almost everything we have asked has been granted. We can’t spill all the beans just yet but there is so much more to come. I just wish Chief Grey Owl and all the elders could have lived to see this day. Don’t just sit there and wonder “call to support”. Many citizens of our Nation who have not been heard from in years are stepping forward to help or contribute. We realize many live long distances away and cannot be there in person, but you can still donate. This is no longer about donations to keep the doors open, this is now a major investment in our future. The time is coming, this is for all the marbles, folks. Get ready, get excited and above all, make sure your tribal information is current. Call the office, go on line to www.notherncherokeenation.com to download update forms. Contact your family members, get this information to them. Once we apply, the hardest work starts, thousands of hours of paperwork. At this time, we have no idea how we will accomplish this BUT WE WILL. The new time line for recognition is now one year instead of 20 or 30 years. Once our application is in, we will be given a certain amount of time to give them an accurate enrollment. They will make us put everyone else in an inactive file until updates are completed. REMEMBER, we must still play by the BIA’s rules. Both Deputy Chief Starr and I will be available 24/7 from now on. If we do have to sleep, PLEASE leave a message. Don’t be left out. Please call, get involved, and help. MO. This is a fun time where we go to exhibit our culture and regalia and mostly just to show off. The parade is about a mile long with many groups and floats. We won the "Best Walking Trophy" as opposed to the best float trophy. This is our third year that we have one "a best " trophy. Our Citizens included Tribal Marshal Two Bears and myself in the lead shaking hands with all our veterans. Daniel White Crow was a hit with the children with Waya, his very large wolf. Then our tribal ladies in their finest regalia, followed by Abraham Eagle Warrior who danced the entire route, meeting and greeting the people. Behind him, came our decorated float with our banners and Great Seal, where our drum Lee Fire Keeper and Gary Big Standing Bear announced our presence long before we arrived. Several vehicles some with our Elders, and other tribal citizens along with our Tribal Princess Candidate Chelestia White Wing Dove. A great time was had by all. And now for some more good news. After two years of meetings with the B.I.A., legislators, governors, and various other trouble makers, Monday June 22nd, the new rules for Federal Recognition were released by the B.I.A. We are at this time notifying the B.I.A. of our official intent to petition. The feds are finally done, now it's up to us. The first job will be to prepare our enrollment per their requirements. Big job, lots of paper, lots of time. But at least we have square one to start at. Much more to come on that. You can keep up with all the latest here, and on www.Indianz.com or www.indianscountrytoday/newsmedia. Both are excellent sources on what is happening. Also our next project is getting ready for our Fall Cultural Pow Wow and Gathering. New water lines are going in to the Pow Wow kitchen and the main building.All the labor has been donated, but we will need to rent a trac hoe for three days at $250.00 per day. That will just about finish this year's major projects. Our ground and building looks amazing, because of you and your generous donations of labor and money. Wado many time over... Of course, we continue to teach our language and now we are singing and writing our own drum songs in Cherokee. It seems that no matter where we go to powwow, the songs are in a language we don't understand. Even though the singers know the songs, often times the meanings have been lost. We are the real people. We will sing in our own language. Osiyo, All my tribal family and citizens. Are we tired of winter yet? I am going to eat the first green thing I see coming up through the snow and I sure hope it’s not poison ivy. At the February meeting, we swore in new council members. A report was given on our recognition conference, that was held in Phoenix, Arizona, that Deputy Chief Starr and myself traveled to. As we go through this process, I think it is very important for us to reflect on what is truly happening. When you come to one of our functions or a council meeting, you need to realize that we have tribal land and office. We have phones and computers, we have a great website, and a Facebook page. We are a functioning government, we have cultural activities. We teach our language and practice our ceremonies. We preserve our culture and history. Try to understand what is actually happening. We are an Indian Nation in progress, existing against all odds. Even the federal agency, put in place by congress to work for all Native Americans, wants to see us fail and just disappear . It ain’t happening folks! Even after the B.I.A. no longer exist, we will still be here. We are recognized as a sovereign nation by the United Nations. Many federally recognized tribes acknowledge us. We are a state recognized tribe in Missouri and soon to be recognized in Illinois and Arkansas. Many states acknowledge us. As citizens of this Nation, you need to realize your importance. You are the tribe. You are everything! So when you think, I don’t really need to go to a council meeting, it's such a long drive, or I don’t need to help the tribe, there is really nothing going on, think again. We are knocking on the door of our best time ever. We are progressing with talks with the B.I.A. that will change our world. So please think again. As citizens, we need you all more than we ever have and the things that are about to happen are for all of us. Call, see how you can help, show up, find out what is about to happen. There is so much every citizen needs to know. Our time is coming. We need every citizen of the Northern Cherokee Nation now. I am on the road 24/7 seeing and talking to many of our tribal family and visiting with them. I will tell you once again, I, as your Chief, am available to you. Call me with your concerns at 573-259-2263. I will return your call if I am unable to answer. The Pow Wow 2013 has come and gone.....but long remembered. This was a really good Pow Wow this year. We had a great crowd, great vendors and great drums. I'm so proud of Native Spirit -- our young and fresh drummer. The crowd loved you!! Native Spirit also pitched in to help clean up the grounds after the Pow Wow. I'm also proud of our new Junior Tribal Princess-In-Training, Clara Allen-Easter. She is a beautiful young lady and will make us all proud. Clara is the daughter of Tribal Members Tony and Sara Easter of Odessa, Missouri. Clara is also the granddaughter of Tribal Members Craig and Lillian Simons. We had the finest group of vendors I have ever seen at a Pow Wow. Their wares were first class, you won't find things like this at Wal-Mart or anywhere else for that matter. Wado, Clinton Chamber of Commerce, and the folks of Clinton and Henry County for coming out and having fun. Wado to Bob and Gail Philby for all their hard work. I don't know how they do it. Wado to Deputy Chief Starr Mayo, and the council. Wado to our great kitchen staff, Mrs Chief, Cindy Linchey, Sharley Hollomon, Jane Hicks and Gary Johnson, the fry bread and food was awesome! 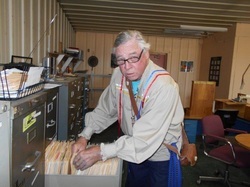 Wado to Mark Fastknife for donating the dumpsters and port-a-pottie's. Nobody is being left out intentionally it would take many pages of wado's to thank you all. Remember, please keep your e-mail's current as this is the way to stay in touch, I have had many bounce back. Make sure we are on your approved list. There are several ways to know what's going one within your tribe, Please stay in touch, especially with family members that don't have computers or i-phones. Also remember we have Pay-Pal for your monthly donations, which is a very secure site and easy to use. Once again, I want to thank everyone who worked, supported, and donated to this year's Fall Cultural Gathering/Pow Wow. Our hard work made this a success. Let's make next year bigger and better for all. We have already started...more to come! Creators Blessings to all, Wado Creator for keeping us strong and together. NOTE: The Northern Cherokee Nation is a 501c(3) not for profit organization. We receive no State or Federal Funding. We depend solely on YOUR generous donations. The Chief continues as a full-time OTR truck driver!! He loves what he is doing and hopes to be able to see many of his tribal family while on the road. The Chief appreciates your continued support for your tribe and your prayers for his safety while he is on the road. I want to thank you for allowing my family and myself to attend and witness the blessing ceremony at Blue Springs Creek. Though we all fought hard to save this pristine waterway, it was with all your help and effort that the battle was won. We are now involved in the Missouri Stream Team and are busy learning how to keep this beautiful waterway clear and clean. We spent a Saturday removing trash from the creek which included the basin and insulation of a hottub, a rusted sign post and many, many liquor bottles and beer cans. We recently had a biologist from MO. Department of Conservation here and checked various areas of the creek for aquatic life and found much that lives happily in unpopulated waters. The fight to save this water and land was well worth it. To know, in some small way, we were able to protect it for generations of all people of this earth makes one feel humble and amazed. I wish to thank you and the entire Northern Cherokee Nation for your support and hard work in saving the creek and the spirituality that the lands hold for all. Early this year I received a call from friends in Rocky Mount, a small town north of Bagnell Dam on the north shore of Lake of the Ozarks. Missouri's Department of Natural Resources had decided to authorize a new sewer treatment plant at the head waters of Blue Springs Creek. The run off from this plant would be allowed to flow in to this pristine water shed. (for an example of native American artifacts found here go to www.RelicShack.com, the Steve Lee Collection. Grave sites dot the creek basin. 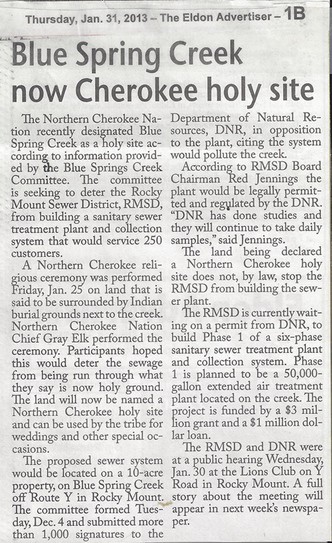 The Blue Springs Creek Committee asked the Northern Cherokee Nation for help. We went to the state Capitol in Jefferson City, MO to meet with legislators. We met with the county Commissioners, and the D.N.R. I informed everyone we met that we would soon go to their proposed site and stake out the grave sites. These graves would have to be excavated and moved. Proper ceremonies would be performed. This, of course, would take much time. Native American Grave sites will not be desecrated. Our representatives advised us not to get our hopes up. Steve Lee, Blue Springs property owner where we held the ceremony. You can't fight city hall, they said. We presented the D.N.R. With over a 1000 signatures. We decided to act. 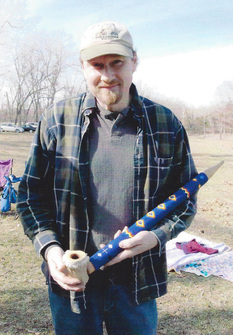 Some of the property in the Basin belonged to Steve Lee, a Northern Cherokee tribal member. On this site we performed the proper ceremonies to bless this land and it was then designated a Northern Cherokee Nation Holy site. We do this so we can have places around the region to continue our culture, traditional wedding ceremonies, adoptions, and naming ceremonies. The local t.v. and radio stations were invited as were the newspapers. One of the news clippings is shown . 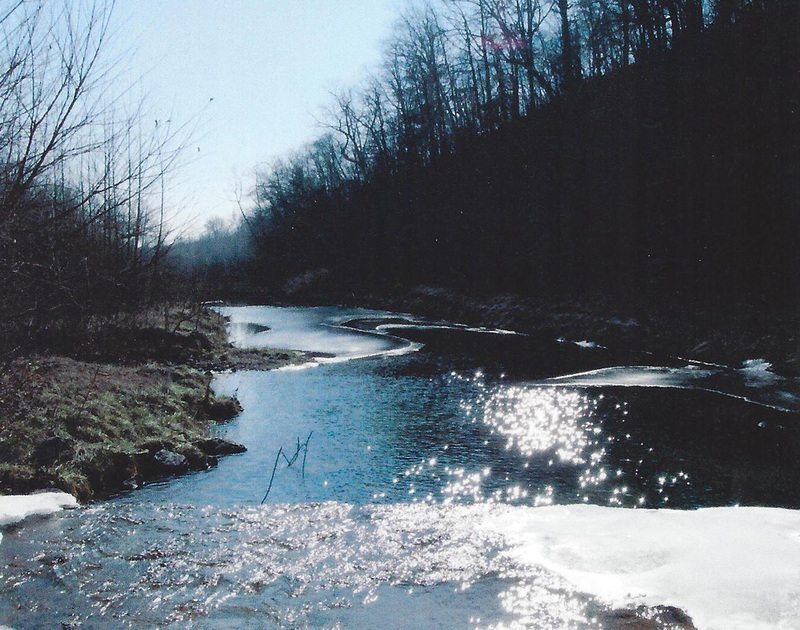 On Feb.7 2013 the final headline read "Save Blue Springs Creek 1; Sewer District 0. When the dust settled the sewer district decided to disband plans for the Blue Springs location. "We don't really want to go to battle with the people of Blue Springs Creek" a Sewer District Spokesman said. I guess they didn't want to play sewer district and Indians either. Congratulations Blue Springs Creek Committee. 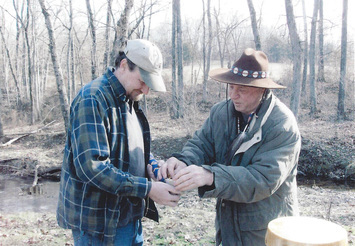 You fought hard for what you believed in, and the Northern Cherokee Nation was proud to help. "They strung turkey bone beads around their necks' in such manner that the breast was frequently nearly covered with beads". (Hill,23) Long & Payne. particular order as to color, served in the conveyance of intertribal messages, or, when woven into a form known as belts, played an important part in the ratification of treaties. In personal adornment, the belts were very effective. Woven into the form of collars, or on strings as necklaces, ear-pendants, or wristlets, they were more commonly used. "The wampum to be discussed... is to be understood as having the form of small cylindrical shell beads, averaging about a quarter of an inch in length by and eighth of an inch in diameter--- the wampum in mind is the cylindrical kind which was made in two colors, white and purple. The quahog or hard-clam (Venus mercenaria), furnished extensively the material for the manufacture of both colors of wampum, although other shells of a suitable nature, such as the columellae of the conch, were used for the white beads. Ear Rings: " The ears are slit and stretched to an enormous size, putting the person who undergoes the operation to incredible pain, being unable to lie on either side for near forty days. To remedy this, they generally slit but one at a time; so soon as the patient can bear it, they are wound with wire to expand them, and are adorned with silver pendants and rings, which they likewise wear at the nose. This custom does not originally belong to the Cherokees, but was taken by them from the Shawnees', or other northern nations. (Timberlake, in Williams, 75-76). Gorgets (Shell): Beverley, in his 'History of Virginia' says, "Of this shell (the Conch) they also make round tablets of about four inches in diameter, which they polish as smooth as the other, and sometimes they etch or grave thereon circles, stars, a half-moon, or any other figure suitable to their fancy" Adair states in his History of the American Inds. "That the priest wears a breastplate made of a white conch-shell, with two holes bored in the middle of it, through which he puts the end of an otter skin strap, and fastens a buck-horn white button to the outside of each." THE SHELL GORGETS THAT MOST EXCITE OUR ADMIRATION ARE NOT THE ONES WITH ICONOGRAPHIC DESIGNS, BUT THOSE DEPICTING MEN ENGAGED IN VARIOS ACTIVITIES. THE DRAWINGS A SPRINGHTLY, INDICATING A SENSE OF MOVEMENT. MEN ARE SHOWN FIGHTING, RUNNING, DANCING PLAYING GAMES, AND PREFORMING RITUAL ACTS... SOME OF THE MEN DEPICTED HAVE ANIMAL FEATURES, PERHAPS REPRESENTING SPIRITUAL BEINGS OR MEN MIMICKING ANIMALS. A WEALTH OF INFORMATION IS CONTAINED IN THESE GORGETS, MUCH OF IT STILL NOT WELL UNDERSTOOD."(Hudson). Gorgets (Stone): These stone pieces, presumably ornaments for suspension about the throat or worn on the breast, have two perforations, and the wear of the cords for attachment is plainly indicated on some of the gorgets. Slate is the favorite material. Leg Ornaments: Most Southeastern Inds. wore leggings at times, and beaded garters, made of bison hair, opossum hair, or other material, were constant accompaniments of these. "String of beads seem sometimes to have been worn by men even without their leggings..." (Swanton,#137,523). It seems that whatever was suitable to hang around their necks , or around their arms, was also used to decorate their legs. Other leg ornaments were the terrapin shells which were strapped to the legs. During ceremonial dances the shells were filled with pebbles, which made a rhythmic sound. Necklaces:' Four sorts of neck ornaments are mentioned, necklaces proper, collars, gorgets of shell, and gorgets of metal. The distribution of the first was most general or, at least, there are more references to this type of ornamentation."(Swanton,#137,516). Strings of animal teeth, most frequently came from bears, but bobcat, groundhog, elk, dog, and human teeth were combined with them. On some of the more the most elaborate necklaces the teeth alternated with marine shell beads which came from the Gulf of Mexico. Beads were often shaped like flat disks, but some were inch-long tubes whose perforations represent remarkable skill with a very small drill." (Perdue). Pendants: There are some small triangular cutouts of conch shell with a groove near the apex for attaching string. Pierced pendants of the same material have been recorded. Pendants with perforation near the top for suspension were made of soapstone, slate, and granitic material. Some had notches on the base or side for decoration. ​Osiyo Tribal Family and Friends. Our first council meeting of the new year was held on Saturday, March 9th. The Creator blessed us with warm spring breezes. I was happy to see everyone who joined us to share winter stories and spring dreams. In attendance was our most honored elder, Charles "Lone Eagle" Griggs, along with his wife and daughter. The meeting was called to order and opened with a prayer by Eddie Beasley for Creator's blessing and guidence. The minutes of the December meeting were read by Mae Stillwell and approved. Many things were discussed for the coming year. The meeting closed with a prayer asking Creator to guide us home safely. Lunch was served and was yummy as always -- thanks to all for sharing with us. I want to thank Stone Akin for sharing his beautiful carvings with us. Mrs Chief especially loves the Turtles. Gary Big Standing Bear, your drum was just wonderful and her song was musical. Gary, you and your Mom, Gloria, are creating one-of- a-kind beadwork. We will be setting up a page for these talented people to display and share their art work with everyone. WATCH FOR IT!! A little about where we've been and what we have done over the last 200 years. In 1831 Benjamin Green was elected as Principle Chief of all three bands, the Sac River Band, the White River Band and the Green Band. The Green Band was also known as the Northern Band. He was followed by a succession of leaders from James Green to Levi Adams. After 1900 we had John Harvey and William Neal. Everrett Jesse Harris was elected in 1940 and governed until 1981. He was followed by David Quentin. Under Chief Quentin the Northern Cherokee Nation was officially recognized by the State of Missouri and Govenor Kit Bond issued his proclamation recognizing the Northern Cherokee Nation on June 22nd 1983. Chief Quentin was followed by Chief Elva Beltz and then her brother Carl Gray Owl Griggs. Phil Hawk Gazer Glascock followed Chief Griggs and on his death was followed by Principle Chief Kenn Grey Elk DesCombes who still serves at this time. Many people ask us, what do you guys do here in current times? Well, of course we maintain our culture, our tradition, our language and ceromonies, but we are also very active in our surroundings. at some of our Pow-Wows we have had over 1200 school children from surrounding schools attend. Many of us go to schools to give presentations on Cherokee culture, history and artifacts. I personally am active with various Boy Scout troops. At this time, a troop from Martha'sville MO. is a vendor at our annual Fall Cultural Gathering and the boys also participate in our Grand Entry and our final closing ceromonies. We spend time at the state capital and on the phone to keep our legislators appraised of our issues. Many of our members are very active with veterans affairs, working with our veterans, both native and non native. This past fall we put on a small powwow at the Kansas City MO. veterans Hospital. Many people say, you are Indians, where is your casino? The Northern Cherokee Nation has now and never will have an interest in gaming. Besides there are casino's everywhere as it is. and every child, native or not is invited and welcomed. Many of these familes are very poor and this may be the only Christmas they will have. Many of our members attend from hundreds of miles away. Every child leaves with all the gifts they can carry, and every car is full for the people at home. In past year's we contacted the Henry County Sheriff's department, and asked if we could help. The Sheriff told us many of the inmates families would really appreciate a Christmas they otherwise would not see. The sheriff was also able to distribute gifts to the battered womans shelter. It took four patrol cars to haul the gifts away. We all had lumps in our throats when the deputies left. Nobody who comes to the tribe for help is turned away, if we can help. For over 300 hundred years, we have asked for nothing from anyone. We are independent and very resorceful. As a nation , we ask for nothing but a fair chance. For the most part we will take care of ourselfs. We would certainly wish to take part in any programs that would benefit both the Northern Cherokee peoples and the State of Missouri. We feel we have a lot to offer. This is not cowboys and indians anymore. We live in your world and well as ours. Get to know us. We are resourceful and good natured. Let us help you make this fine and unique state, a better place for all of us. ​Beginning here now is the most extensive article on Cherokee culture, lore and knowledge ever compiled. The sources are vast and will be listed here. Many including myself have offered material and records. The introduction and personal insights are mostly from Oukah, a North Texas Cherokee, an extremely knowledgeable and honorable person. This article is now over 300 pages and will grow forever. Here we go. What were the Cherokee people like before the white man came? How did they live? What did they eat? What were the Cherokee habits and beliefs? Research into the old books and articles have revealed the following. Nothing in this article has been taken for granted, and everything has been verified. In most cases the source and page no. have been included. If any of you have material, culture or knowledge you think should be included, please forward and it will be sent to the authors. Research has convinced us that it was all over by 1880--that is, by then all the people of Cherokee blood in the Oklahoma area were living just like their White pioneer neighbors around them. There was very little left, if anything left. There were no more clans, no council meetings, no teaching of the young in ancient Cherokee ways, because by then nobody alive knew anything about it. It only takes one generation (who are not taught) for it to be gone forever, and that time had passed. The previous generation had just moved (mostly through the Trail of Tears) from their ancestral grounds east of the Mississippi into what is now the northeastern part of Oklahoma. The times had been hard. Many had died. Very little, if anything, had been passed on by word of mouth. It was gone. Fortunately, some of the old ways had been written down, not enough, but some. It seems impossible that the names of the seven Cherokee clans (which controlled all Cherokee affairs) cannot be accurately ascertained today. There are half a dozen lists of them, none of which totally agree. The old Chickamaugan clan system (which has never been seen in print) is probably the most accurate. The genocide had worked--whether deliberate or due to cruel circumstances, knowledge of ancient Cherokee life (before white man came and ruined everything) was gone. All the living Cherokees of the last century ever heard was the term Chief. Chief is an English word which became a generic term, like “moccasin” or “tomahawk”. It is not Native American at all, in any language. It was not in general or official use by the Cherokees, Creeks, Choctaws, Chiekasaws, etc until into the 19th century, about the time they wrote their constitutions in the 1830’s. Until then, the Cherokees were presided over by an Oukah (uku, ukuh, ookuh) Which Was always translated as King and the Creeks, Choctaws, Alabamu’s etc (muskogeean) by a “Micco”, again always translated as “King”. King is translated as ooguhweeyouhee. Go figure. Young Cherokees today will tell you they grew up being told they were “Indian” belonging to a “tribe.” They should have been told they were “Cherokee” belonging to a Nation. The authors have persisted in trying to teach as much truth and knowledge as they can uncover and discover. Nobody else has seen fit to or know enough to produce this work. This has been done using as many sources as can be named or is felt necessary to prove a point. With this newsletter and the ones to follow, We will print as many of these articles that we can afford at the time. Collect these. Someday this knowledge may be gone forever. The elders who still retain much of this knowledge are getting along in age. Croslyn Smith, Richard Craker, and a few others are the last there is. They should be treated as national treasures. Their value and eventual loss, to all of us can’t be imagined. Something for all of us to think about everyday is how to help and preserve these elders and their knowledge. work on our tribal headquarters, with more to come (remember Mrs Chief's wish list?) Watch for her page. tribal members, and friends, our kitchen, and the car and bike and auction were a huge success!!! Many thanks to Bob Philby and his wife Gail for taking charge and making it all come together and happen. special thanks to Buck and Sharley for mowing and making our grounds the best grounds out there, to Mike Ford for the gravel for the grounds and parking area. (no more mud!) Thanks to Gloria & John Bailey for donating the paint for the council room (to be started on soon). Wado to all of you who helped and donated to make this gathering a success. We are constantly updating our files, so if you have moved, married, or changed contact info please let the office know. ​May the Creator bless you and your family. May He guide us in our quest for unity and peace. May truth and kindness guide our footsteps.